Seriously, Nintendo? We all expect the cheap character mash-ups from Capcom, Namco, and SEGA these days, but I never thought we'd find you digging your heels in this silly trend. Yet here we are, the Nintendo Direct is now complete, and Shin Megami Tensei X Fire Emblem on the Wii U is officially a thing. Yes, in one of the more bizarre announcements from Nintendo's press conference today, they are apparently teaming up with developer Atlus to create a mash-up game combining the lores from their two most popular RPG series. I can't think of anything that could clash more with Shin Megami Tensei's hell raising post-apocalyptic Japan than the noble medieval adventures of lords and knights found in Nintendo's Fire Emblem games, but I guess someone believes they can make such a strange pairing work. While we have nothing but a teaser trailer and no gameplay to go off of, I think its safe we assume this will be a strategy RPG. Fire Emblem created the genre back on the NES and has stuck to its formula ever since, while Shin Megami Tensei has experimented with a few side entries on the DS in recent years. Not to mention that most mash-ups out of Japan, like Project X Zone and the Super Robot Taisen games, are strategy RPGs as well. From a business standpoint, this game makes total sense. Fire Emblem: Awakening on the Nintendo 3DS has been a big hit in Japan, and Shin Megami Tensei IV is currently Japan's number one most anticipated Nintendo 3DS game as well. The only problem I see is that mash-ups like these never really pan out critically, and it would be shame to see it potentially damage these two huge games for Nintendo. We'll see how things turn out, but consider me more puzzled than anything on this one. 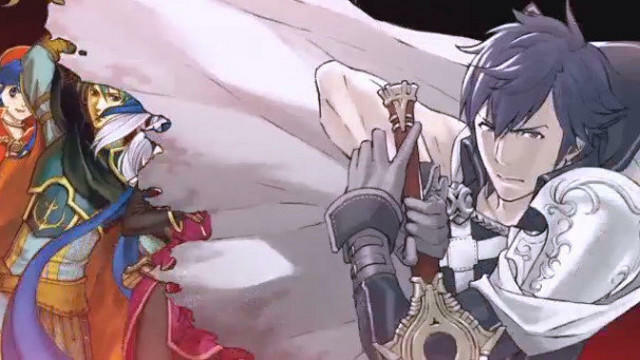 Oh yeah, be sure to pick up Fire Emblem: Awakening once it comes out on February 6th for the Nintendo 3DS. Shin Megami Tensei IV does not yet have an American release date yet, but the series has been finding its way over here over the last decade. Expect it some time in the near future.